Indians Baseball Cards: #PackADailyCircus - 141-142 - Blaster Box Coupons? 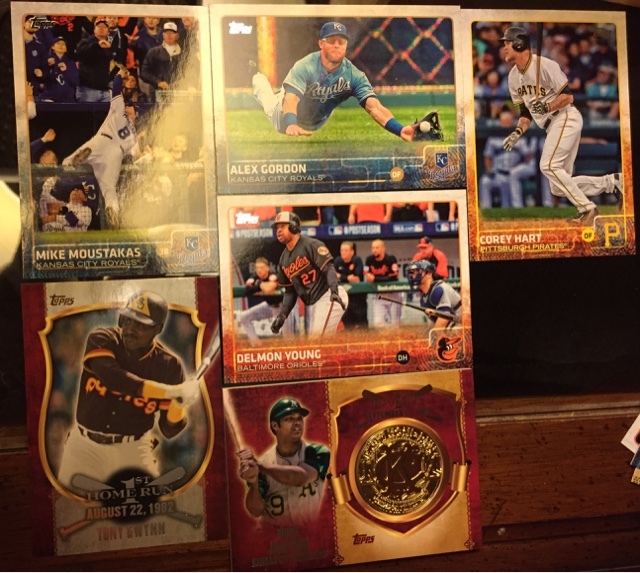 #PackADailyCircus - 141-142 - Blaster Box Coupons? Every year, my family and I head out for a last weekend getaway "hurrah" before school starts. This past weekend, we headed to Little Rock to do some tax-free back-to-school shopping. While in one of the Walmarts, I came across a 2015 Topps Series Two box that had 10 packs plus a Home Run Patch card. Attached to this box was a "Save $2.50 instantly" coupon. A coupon. On baseball cards. On THIS year's baseball cards. Interesting. Wow! Two inserts in a single pack. That is very cool! Congratulations to Backstop Cards for a very nice-looking 1st homer card! Also giving a hand to the VC Royals who managed two hits from the pack - almost back-to-back. Sweet! Congratulations, CC Superchickens! The 1st Home Run cards feature a medallion (presumably metal) embedded in the card along with a photo/rendering of the player from the time of the 1st home run. Pretty cool!